New Delhi: A Muslim couple has filed a plea in the Supreme Court, seeking an order allowing the entry of women in mosques. The top court will hear the matter Tuesday. In the petition, the Pune-based couple has submitted that prohibiting women from entering mosques is discriminatory and violates fundamental rights. At present, women are allowed to offer prayers only under mosques coming under Jamaat-e-Islami and Mujahid denominations. However, they are barred from entering mosques that fall under Sunni denominations. The plea, filed by Yasmin and Zuber Peerzade, stated “the core ethos of India has been a fundamental unity, tolerance and even synthesis of religion”. “Women, like men, are also protected by the rights in the Constitution which allow them to offer worship in accordance to their belief,” the couple stated. 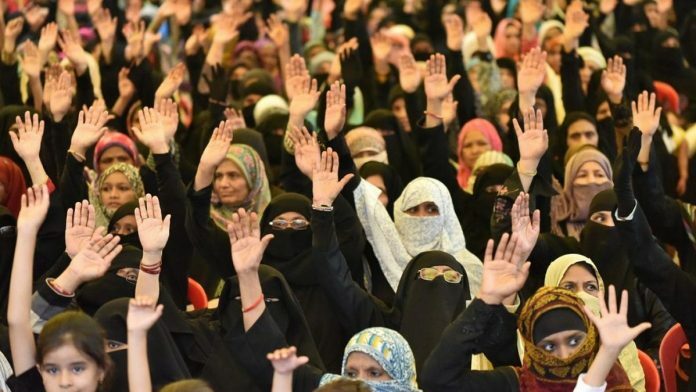 The petition, filed through advocate Ashutosh Dubey, further stated that the legislature had failed to protect the rights of Muslim women. “Despite the observations of this Hon’ble Court for the past few decades, Uniform Civil Code remains an elusive constitutional goal that the courts have fairly refrained from enforcing through directions and the legislature has dispassionately ignored except by way of paying some lip service,” the plea read. The plea blamed Islam for bringing in discrimination between men and women. The petition stated there was nothing in the Quran or in any teachings by Prophet Muhammad that opposed women from entering mosques and offering prayers. “The Quran does not differentiate between man and woman. It speaks only about the faithful. But Islam has become a religion in which women are being oppressed,” the plea stated. While the couple accepted that there were diverging opinions on this issue, they relied on Prophet Muhammad, who is believed to have supported the entry of women in mosques. The couple even pointed out that mosques that permit women to enter have separate entrances and enclosures for them. “…Women are allowed to enter mosques that have a separate space for them, but most mosques in India do not. Socially, Indian women are not encouraged to regularly pray at mosques even if they do have separate enclosures,” the petition stated. “Most women visiting the Jama Masjid, for instance, would be Muslim tourists in Delhi rather than residents of the capital,” it read. “There should not be any gender discrimination and allow (sic) Muslim women to pray in all mosques, cutting across denominations. It is submitted that there is no such gender discrimination to offer worship in Mecca, the holy city. The faithful, both men and women, together circle the Kaaba,” the petition read. The couple also questioned that if allowing women to enter into mosques or an eidgah creates fitna (distress), how were women allowed to participate in the Hajj and Umrah (a smaller pilgrimage to Mecca). The petition further relied on the top court’s 28 September 2018 verdict, where it allowed women of menstruating age to enter the sanctum sanctorum of the Sabarimala Temple in Kerala. “On one side of the spectrum, an Islamic theologian in Canada, Ahmad Kutty, has said segregation of the sexes is not a requirement in Islam, as men and women interacted in (Prophet) Muhammad’s time without any partitions,” the plea read.